oc---, you know, the waves, you know, passing by. I live, I'll never forget." States, the downtown New York." 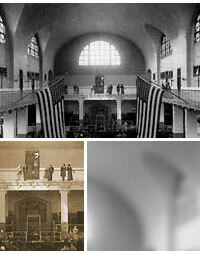 Immigrants were first lead into the huge Registry Room on Ellis Island. This was the beginning of a process that included lengthy waits for medical and legal inspections. Fear and confusion often resulted in being crowded into this large space with so many other people, all anxious, all speaking different languages. shawls. And the men had the fedoras on." jabbering away in their own languages." Ellis Island was a place which engendered contradictory feelings. Immigrants recognized it joyfully as the entry point to their new home, yet feared what might happen there. While only 2% of all immigrants were sent back, all immigrants felt fear of detention and expulsion. had to go through. It's an ordeal." People brought a range of personal items with them to America. Some carried their most valuable possessions, others arrived only with the clothes on their back. of clothing and my books." were my father's army shoes." since I've been a child." "Alpaca wool blankets, they were beautiful." Immigrants express the confusion and pain of living between two homelands. Often they arrived not knowing the language, "greenhorns" in an unfamiliar landscape. While they embraced the freedom and new opportunity of America, they missed their place of birth and their sense of knowing their place in the world. understand. Different life, everything was different. But, I never despaired. I was optimistic."